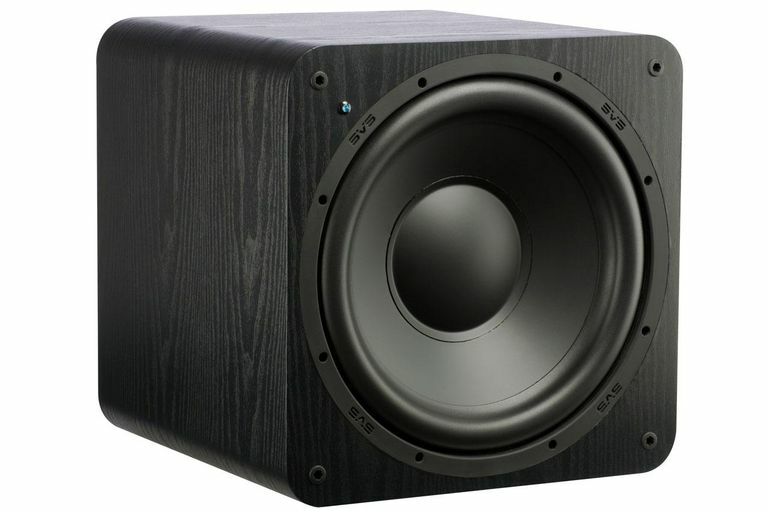 The SVS SB-1000 is a subwoofer that is not much larger than its 12-inch driver. However, inside its small cabinet is an amplifier that can output more than enough clean low-frequency audio output power for a small or medium size room. In addition, the SB-1000 provides adjustable volume, phase, and crossover controls, as well as several connection options that can work with just about any home theater receiver. Design: Sealed Enclosure (Acoustic Suspension), built-in amplifier, 12-inch diameter front firing driver. Power Output: 300 Watts RMS (720 watts peak). Frequency Response: 24-260 Hz +/- 3 dB (measured at a 2-meter distance from reflective structures). Crossover: - Adjustable from 50 to 160 Hz. Connection Options: RCA LFE or L/R audio cable connection (both in and out), High-Level speaker connections (input only). Power Consumption: .5 watts standby mode, up to 300 watts in operating mode. For this review, the SB-1000 was alternately connected to the subwoofer preamp outputs of both an Onkyo TX-SR705 and Harman Kardon AVR147 home theater receiver to the LFE input on the Subwoofer. As far as physical placement goes, the SB1000 was placed in both a corner and side wall locations. SVS suggests a corner placement as the first (and preferred) option, or along one of the side walls as a second option. If you opt for a side wall placement, my suggestion is to use the "crawling for bass" technique to find the best bass response. It is also important to note that you should not place the subwoofer flush to the wall - bring it out a few inches. After you have determined how much, and the quality, of the bass output, you need to match SB-1000 to the rest of your speakers so that the crossover frequency and volume level is balanced. The quickest way to do this, and also suggested by SVS, is to use your home theater receiver's onboard automatic speaker setup system (such as Audyssey, MCACC, YPAO, etc...). These setup systems provide the home theater receiver a way to set the subwoofer level and equalization in relation to your other speakers. It is also usually possible to manually tweak the results obtained via any of the automatic speaker setup options. However, if your home theater receiver does not provide an automatic speaker setup system, or you prefer to set the crossover frequency and output level of the subwoofer manually, the SB-1000 does have its own crossover and volume controls for this task. You can do this either by ear or better yet, have a sound meter handy for more precise adjustment. System One (5.1 channels): 2 Klipsch F-2's, 2 Klipsch B-3s, Klipsch C-2 Center, Klipsch Synergy Sub10. System Two (5.1 channels): EMP Tek E5Ci center channel speaker, four E5Bi compact bookshelf speakers for left and right main and surround, and an ES10i 100 watt powered subwoofer. With the speaker systems used in this review, both the original subwoofer and SB-1000 were used for comparison. Settings were adjusted accordingly. After several listening sessions with a variety of content, I found that the SVS SB-1000 was a very good match for the rest of the speakers used in both comparison systems. The SB-1000 provided very good tight bass for its small size. Using a variety of Blu-ray discs and DVDs with prominent LFE soundtracks (such as Battleship, Jurassic Park, Master and Commander, and U571) the subwoofer showed no fatigue, but was not as earth-shattering at the extreme low frequencies as the Klipsch Sub10, but was less boomy than the EMP Tek ES10i subwoofers used for comparison. On music-based material, the SB-1000 reproduced good overall bass response, doing especially well with music tracks featuring acoustic bass detail, but did exhibit drop off in volume output in the reproduction of the bottom end of the sliding bass riff on Heart's Magic Man and was not as impactful on Sade's Soldier of Love as the Klipsch and EMP Tek ES10i. On the other hand, SB-1000 provided good bass texture without being overly boomy in the mid-bass frequencies and mixed well with the rest of the speakers in both setups. Overall, the SB-1000 provided a clean, but not overly exaggerated, bass response that was effective, and the subwoofer had excellent recovery time between dynamic bass peaks. Using the subwoofer frequency sweep tests provided on the Digital Video Essentials HD Basics and THX Calibrator test discs, the output level of the SB-1000 was strong to about 40Hz, with some audible decrease between 40Hz and 30Hz, then dropping off steadily. That being said, the compact 12-inch sub delivered a more than adequate low-frequency output for both movies and music that would be well-suited for a modest home theater system in a small or medium-size room. Another thing to note is that the SB-1000 is surprising light for a 12-inch subwoofer containing a 300-watt amplifier, weighing in at only about 27lbs. Combine that with its easy-to-hide compact size, this subwoofer can make a great addition to your system without being an eyesore in your room. If you are looking for a subwoofer that provides a good balance of power output, low-frequency response, installation convenience, and price ($499 suggested), definitely give the SB-1000 consideration. Although the SVS SB-1000 was introduced in 2013, as of 2018 it is still a key part of the SVS product line-up - definitely a testament to its popularity.